Enjoy these cool neon facts for kids and learn more about who discovered neon, what happens when the element is electrically charged and the interesting history behind the noble gas. Check out a wide range of information that covers everything from the chemical properties of neon to its use in advertising signs. Neon is a chemical element with the symbol Ne and atomic number 10. The name neon comes from the Greek word νέον meaning new. Neon is a colorless, odorless inert (not chemically reactive) gas. It is in a group called 'noble gases' in the periodic table. Neon has about two-thirds the density of air and is the second lightest noble gas after helium. 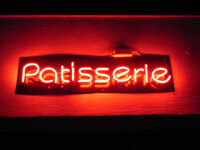 Neon was discovered by British chemists Sir William Ramsay and Morris W. Travers in 1898. The pair were studying liquid air by chilling a sample of air until it became a liquid, then warming the liquid up and collecting the gases as they boiled off. Neon was the second of three new gases to be discovered by the pair the first being krypton and the third xenon. Neon has no true chemical compounds, meaning it forms no compounds to fix it to solids or join with other elements. The melting point of neon is -433.46 °F (-258.59 °C) and the boiling point is -410.94 °F (-246.08 °C). Neon is the fifth most abundant chemical element in the universe after hydrogen, helium, oxygen, and carbon. It is however, a rare gas in Earth's atmosphere, making up just 0.0018%. Stable isotope forms of neon are produced within stars. Neon gas emits a brilliant red-orange color when charged with electricity. In 1902, a French engineer Georges Claude began creating neon lighting with the surplus neon leftover from his air liquefaction company. He tried using neon tubes for indoor lighting, but the color put homeowners off. So instead, in 1912, his company began selling neon discharge tubes as advertising signs. Neon advertising signage was a success and in 1923 the concept was introduced to the U.S. when two large neon signs were put up by a Los Angeles Packard car dealership. While neon accounts for the bright reddish-orange light in advertising signs all other colors are generated by other noble gases or by colors of fluorescent lighting, yet they are still referred to as neon signs. Today, neon has uses in vacuum tubes, high-voltage indicators, lightning arrestors, wave meter tubes, television tubes, plasma tubes and helium-neon lasers. Liquid neon is also now commercially available and is used as a cryogenic refrigerant. Because neon is quite rare in our atmosphere both neon gas and liquid neon are relatively expensive costing more than 55 times that of liquid helium. If a balloon is filled with neon it will rise in the air but do so at a much slower rate than a balloon filled with helium.